As a mom and busy women on the go, it can be hard to make time for yourself when it comes to a beauty routine or regimen. Especially after having baby number two, i had to learn to prioritize myself in the midst of all the chaos! I’ve learned that having a few staple items that really work for me make all the difference and give that extra boost of confidence when it comes to my appearance. Here are of few of the holy grail items that I think all moms should have in their repertoire. This wash is one that i swear by! I have been using this for years and its so effective. I have oily-combination skin, so breakouts are definitely something I need to keep at bay. This formula really cleanses away any oil and shine without a harsh over drying of the skin. I have very sensitive skin as well, so using a product that does not cause any irritation or rashes is a god send. Its quick and easy with no sitting time necessary. So its the perfect was and go facial cleanser that is very effective. I usually pick this up for around $6.00. I just started using this brush about a month ago, and It works so well. I typically use a standard facial loofah for exfoliating purposes but I wanted to try something new, something a little less abrasive. This brush is definitely more gentle on my skin. The bristles are soft yet still are strong enough to completely get rid of the dead skin. Because its a hand held exfoliating brush, I also feel i have more control over the speed and amount of pressure that is applied. I like this cleansing brush because it gives you mini facial without the expense or the time. This brush is only $4.00! Having a great moisturizer is probably one of, if not the most important of all the beauty essentials. There is nothing like great, moisturized, healthy looking skin, which brings me to the Bright Booster. I have been using this for a couple of months now and believe me when i say it has done wonders! Its an oil based serum that absorbs right into the skin. It makes my skin so soft and gives it an amazing natural dewy glow. It can also do double duty as a makeup primer or you can just wear it on its own as a moisturizer. As a primer, it holds my makeup in place and still allows the dewy glow to shine through. It does all of this without clogging my pores. I’d say that every women should at least give this product a try. It costs about $13.00, which I think is a really great value for all that it does. My final item on the list is something for the lips. my lips are the first part of my body to feel the affects of cold weather. I live in the Midwest and it can get bitterly cold here in the winter. 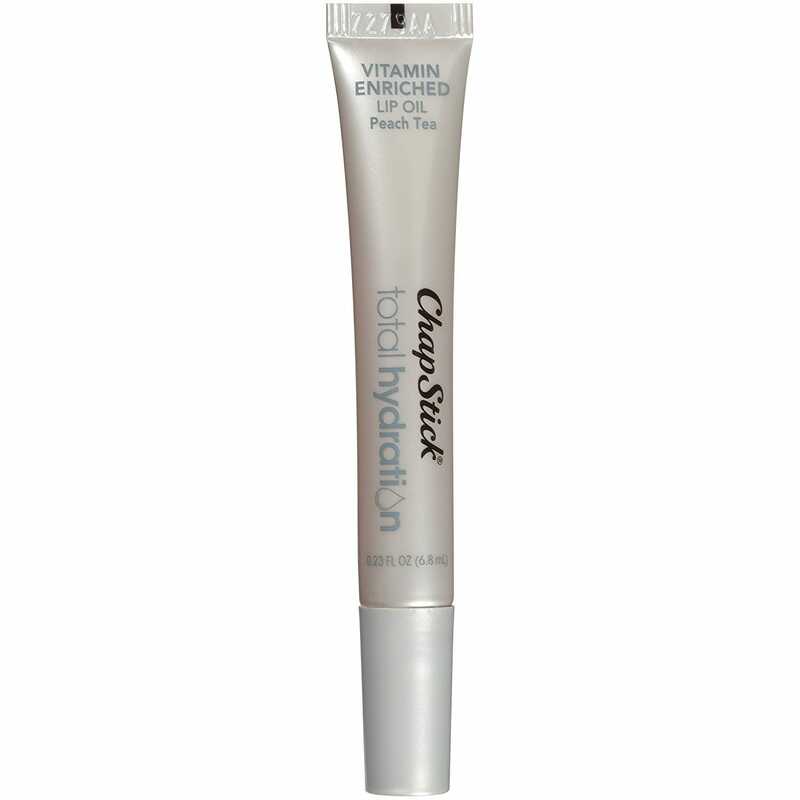 Because of this I’ve started using the Total Hydration lip oil by Chap stick. I was looking for something I could use for daily hydration and that would give me a high glossy shine. On those days when I’m not feeling a colorful lip, or have a lot going on and don’t want to wear any makeup, I opt for a clear high shine lip gloss. This lip oil offers both. It has a med- thick consistency that absorbs into the lips easily. And also has sweet peach fragrance that even my five year old daughter loves. If you’re looking for a really good, hydrating and high shine gloss/lip oil for every day use, Id say you have found it in this product. You can purchase this for around $5.00, which is a great deal. Taking time out for yourself as mom can be really hard to do ( a lot of the time) so I think Its nice to have a few easy go to options for daily use. I really hope that these item suggestions can be useful to you and give you some ideas of how you can incorporate something new, that allows you to focus just a little more time on yourself. Please comment and let me know what beauty essentials or must haves that you use. Id love to hear your recommendations and explore new products! Its been a while since my last post (almost a year and a half to be exact) and in that time a lot of has happened. Id say the most note worthy of all is the birth of my 2nd child, my baby girl Kaia. Obviously I’m no stranger to motherhood. I have an almost 5 year old and have gone through the tiny infant and toddler stages, so i felt like i was pretty well equipped to handle it for the second time. What I realized quite quickly was how unprepared i actually was. It seemed like everything about the delivery and postpartum was so drastically different from the first time, that i found myself feeling completely out of control and convinced that i was loosing my mind, lol. So, all through out my pregnancy I was concerned about how my 5 year old daughter would respond to her new little sister once she arrived. She had been the only grandchild on both mine and my husbands sides for almost five years, and I didn’t expect her to share her top spot that easily. Fortunately, my oldest welcomed the baby with open arms and continues to be so loving and caring towards her and shows no signs of jealously. What i really didn’t anticipate were the over whelming feelings of mom guilt that I would have. Prior to giving birth I was always confident that i would be able to juggle and balance both girls and give them each what they needed individually once the baby arrived. But that changed once the baby actually arrived. Even as early as being in the hospital, i felt so unsure as to how i was going to equally distribute my time and love between my two kids. I didn’t want my oldest to feel left out due to all the attention the newborn was getting from mommy and daddy. I also didn’t want my new little baby to miss out on the one on one bonding time that she needed. I spent a lot of time in first few weeks stressing out about this. As the weeks rolled by, my oldest was the one who really helped me see that even though it may not feel like it, they both had everything they needed from me. One day i just asked her: ” Do you feel like mommy and daddy aren’t there for you like we use to be? “Do you feel like you’re not getting enough attention from us?” She responded with “Yeah, but it because you have to be with the baby because she needs you, I’m a big girl!” Her response made me realize that even though the dynamics had changed, she understood why and she still loved me. I also realized that including my oldest in on the baby duties helped her and me still have time together while i was with the baby. Simple things, like her just sitting next to me while i fed the baby helped me see that she still felt connected to me and that I was able to spend time with her. I still deal with feelings of mom guilt in different situations. And I realized that Its probably something that will always be. But I work through those feelings and I’m comforted by the fact that when i look at my kids they are thriving and happy and that’s really all that matters. Wife or Mother: Which role is more difficult? Due to were I’m at in this particular time in my life, this question is really starting to resonate with me more than ever. I find that its also something on the minds of the women in my life as well. On more than one occasion I’ve had this conversation with my girlfriends and family members and the outcomes and thoughts on the answer seem to be overwhelming one sided. Mostly, the answer I get is “Obviously being a mother” or “Hands down motherhood”. So I wanted to explore this idea a little further. As mothers, the task that we are charged with is one that I can hardly effectively summarize in words. In my opinion, its the single most rewarding job I could every have and yet at the same time its full of extremely difficult challenges that I could have never prepared for. The daily physical exhaustion of running behind a toddler and managing her every move and meltdown can defiantly get the best of me some days and that’s just part of the journey with these amazing little humans we decided to create 🙂 Ultimately, I feel that the bond between my child and I is just natural and organic. NO matter what she does or doesn’t do my love and support will never go away and for the most part I don’t really expect anything in return except for maybe when she’s older and good grades and making the right decisions comes into play, lol. I don’t rely on my role as a mother to feed me or fulfill me in the same way as the partnership I share with my husband. Motherhood definitely does fulfill me , but just in different ways. As far as marriage goes, it is also an amazing journey full of rewards and challenges as well. But I find myself feeling more inclined not to side with my family and friends and choose the wife role as maybe being more difficult in my world. I say this because marriage involves taking two different people from different backgrounds , experience’s and up bringing’s and then meshing all those differences together to build a life together. With doing that there is an inevitable and continuous amount of compromise and sacrifice that has to be given. And because as a human, its not my natural inclination to compromise or put others first generally speaking. I mean, you learn those behaviors obviously as child, to be respectful and treat others the way you want to be treated, but you’re also taught to self preserve and do what’s in your best interest and what will make you happy. And in marriage I feel those themes are challenged at the highest level. And this is not to say that sacrifice and compromise are not attached to motherhood as well because they most certainly are, but in marriage its a different kind of sacrifice and compromise. Its a sacrifice that is linked to the idea of a certain level of expectation, an expectation that our partner will treat us in a way that feeds us emotionally. A compromise that relies on our ability to humble ourselves and put our partner first in way that we may not be use to- I know I wasn’t. I think that’s the piece that most difficult or “different” between the two. Really being able to create one of the strongest emotional bonds with someone you 1. Didn’t birth or 2. Didn’t give birth to you, or 3. Has no blood line affiliation with you what so ever, and by engaging in behaviors that are not comfortable to you and that force you off of your sometimes self centered pedestal. And of course there are so many different aspects to both roles and relationships, this just happens to be one of the complexities that sticks out to me. I also feel that ranking the difficulty of these roles can and will switch throughout my life and all depends on where you’re at in your life’s journey and what happens to be going on at the time. My marriage and my motherhood are two of the best things in my life and shape me into the women I am day by day. Let me know what you think about this topic, I’d love to hear others’ thoughts and ideas. Thanks for stopping by “My Favorite Place”. ​Hello all! I’m super excited about starting up my blogging once again. After an inconsistent attempt at blogging several years ago, I’m back and ready to get into the blogging groove. I love to write and connect with others and i am really in need of a creative outlet at this time in my life. Just a little bit about me: I’m a 30 something (early thirties, lol) mother and wife. I love my family, all things fashion, interior design, beauty and giving my opinion on any and everything. So, that’s pretty much what I’ll be discussing in my blog topics. With that being said thanks so much for tuning in as i explore this creative journey, goodbye for now!